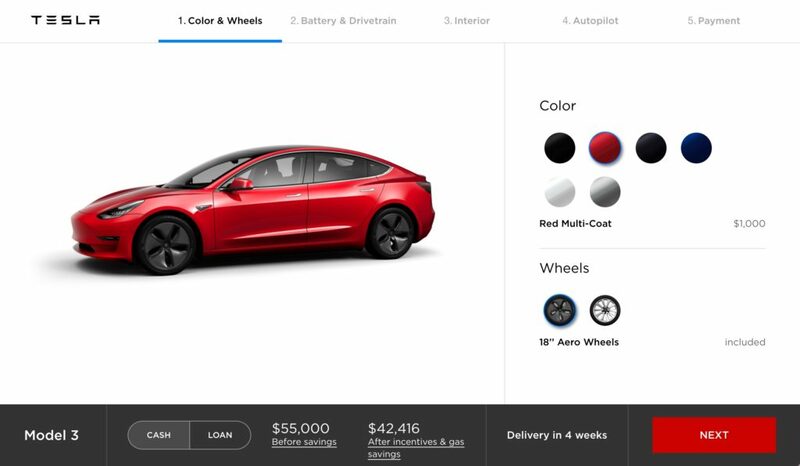 As Tesla begins to roll out Model 3 display cars to its showrooms across major markets in the East and West Coast, the Silicon Valley-based electric carmaker is making updates to its Model 3 online configurator and gearing up for an expected uptick in preorders. Appearing in the newly updated Model 3 design studio is a reference to the highly anticipated all-wheel drive, dual motor configuration, which is expected to arrive in Spring 2018. 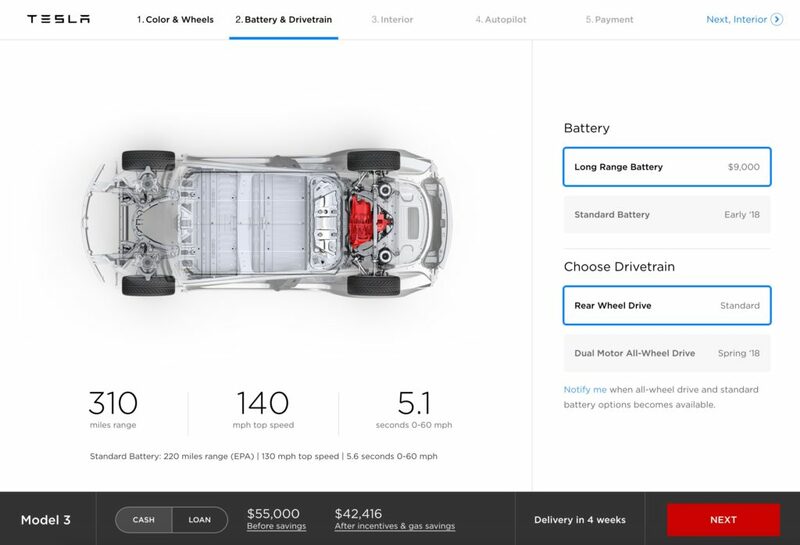 Currently, buyers of Tesla’s mass-market compact sedan can only choose from a long-range edition of the Model 3 in a single motor, rear wheel drive configuration. The Long Range Model 3, capable of 310 miles of range per single charge, commands a $9,000 premium over Tesla’s base Model 3 with ‘Standard Battery’. 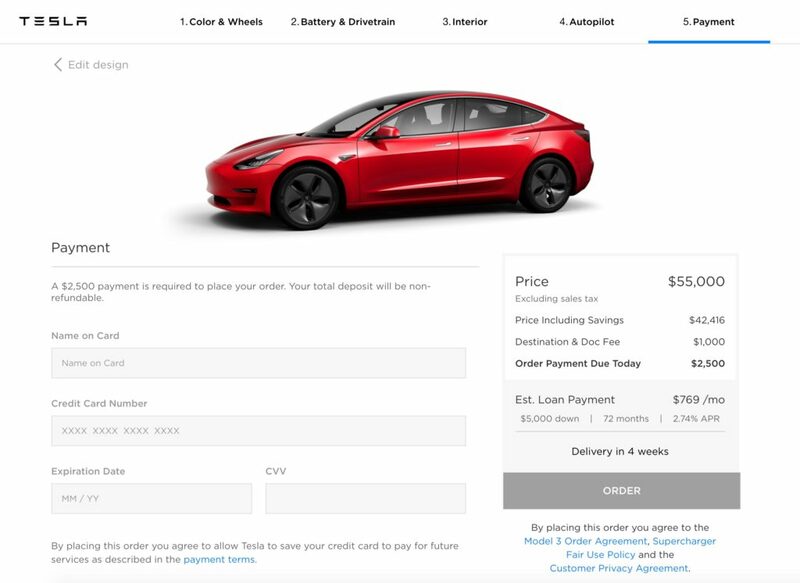 According to current messaging on the Model 3 online configurator, the 220-mile-capable $35,000 base version will be available sometime in early 2018. As noted in Tesla’s recent communication that invites the general public to experience Model 3 in select stores, Tesla sales rep will be on hand to educate interested parties on the benefits of Tesla’s dual motor all-wheel drive system. “As we continue to enhance our vehicle line-up, you’ll also have the opportunity to learn more about our Dual Motor All-Wheel Drive system, now standard for Model S and Model X.” reads the email invitation. Tesla discontinued the Model S 75 with rear-wheel drive last summer, leaving Model 3 as the only vehicle in its fleet that’s purchasable in a single motor configuration. However, recent CARB filings suggest that Tesla might be bringing back the Model S 75 sometime this year. 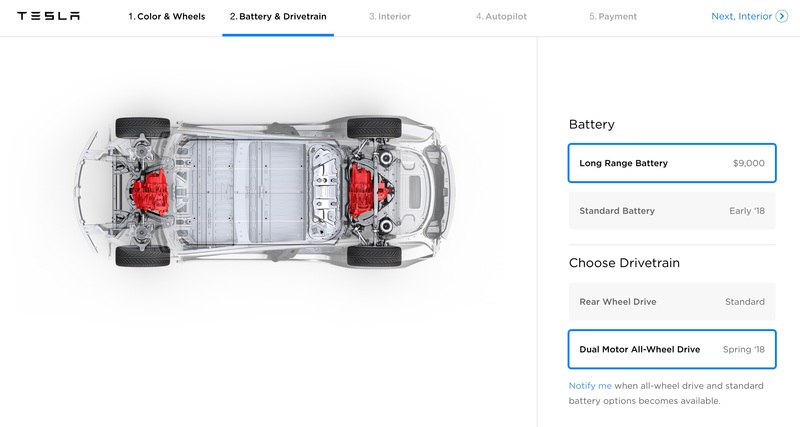 Taking a closer look at code within the Model 3 online configurator and we can see an image of the upcoming dual motor drivetrain. 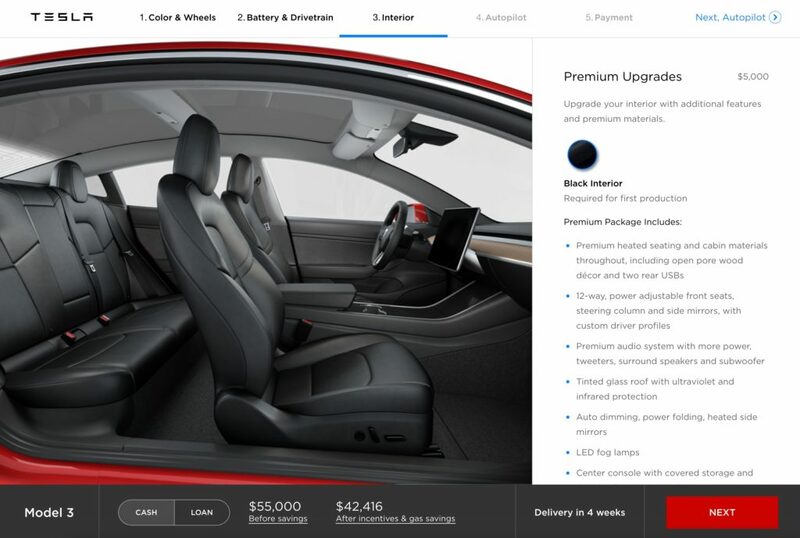 While there’s no pricing information buried within the code for the all-wheel drive system, one might be able to glean insight from previous upgrade costs for Model S. Tesla charged a $5,000 premium to upgrade a Model S 75 to Model S 75D in a dual motor configuration in early 2017. In addition to adding the Dual Motor All -Wheel Drive selection to the Model 3 design studio, albeit temporarily disabled, Tesla also updated the screens for selecting the interior trim, Autopilot and the payment screen. 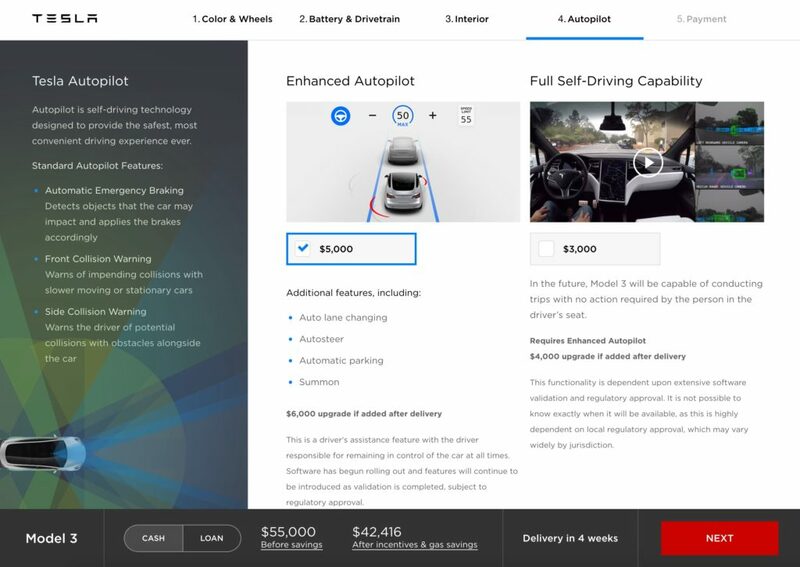 Screenshots from the Model 3 online configurator provided below.